Welcome to the Molesey Local History Society. Molesey comprises the two villages of East and West Molesey in North Surrey, England (see map). It lies to the south of the River Thames close to Hampton Court Palace. The rivers Mole and Ember flow through Molesey down to the Thames and the three rivers have played an important part in shaping the rich history of the area. The main aim of the Society is to awaken and foster an informed interest in the history of Molesey. We hold regular meetings and publish newsletters throughout the year. We have also established research groups, which meet to work on various specific topics. You can follow the links on the left to find out more about these. 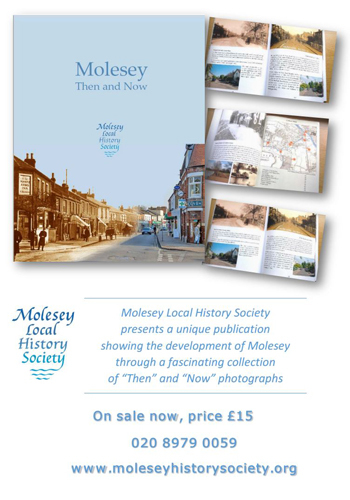 We would be delighted to hear from anyone with an interest in the history of Molesey. has recently been published with over 1,000 copies sold. We only have a limited number left. The video was uploaded to YouTube by Steve Field on 29 Apr 2017 and is based on old postcards of Molesey and Hampton Court.